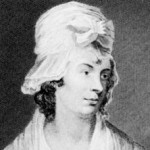 Charlotte Turner Smith was born in London, England. She was an English poet and novelist. Charlotte joined Benjamin in debtor's prison, where she wrote her first book of poetry, Elegiac Sonnets. Smith was a successful writer, publishing ten novels, three books of poetry, four children's books, and other assorted works, over the course of her career.